If you haven't heard, Zynga is in a downward spiral. They're collapsing. They've shutdown some studios and laid off more than a 100 employees. Zynga's stock has plummeted into celebrity-hobo status and on a scale of Dancing With The Stars they would be Kate Gosselin. Well, Blizzard wants to help them out and they've been sending some welcoming letters to former employees of Zynga, however, that's being overshadowed by this whole auto-banning of Linux users while denying them refunds. Just yesterday we reported on more Linux users being auto-banned from Diablo III. The circumstances are identical to the ones that occurred back in July, where a number of Linux WineHQ users were caught off guard with auto-bans and no options for refunds or to dispute their case. Thank you for your continued correspondence. After a thorough final review of the action taken against this account, we have arrived at the same conclusion. The action will not be reversed or changed under any circumstances. As this issue has been reviewed by multiple representatives, it is now considered closed. If you have questions regarding a different account or issue, please feel free to contact us again. However, further inquiries regarding this issue will no longer receive a reply. This was identical to the responses Marcus Meng, William Taylor and many others received back in July. Even after I talked directly with a representative at Blizzard, their cases were neither expedited for proper review nor were any resolutions brought forth to confirm that the Linux users were indeed cheating. I'm running Kubuntu 12.10, 64 bit. However, I'm running Diablo in a 32 bit wine bottle. This issue is very real. I've only had time to kill Diablo with one character, and only on normal mode. My biggest character is/was level 36. Cheating? Really? I've got no gold, no good gear, and a bunch of low level characters. Just exactly what did I do when I supposedly cheated? If I hadn't paid only $10 for the game at Toys R Us I'd be pissed! Following up on that sound advice, and as mentioned back in the original article when the bans took place: Don't feed Blizzard and don't play Diablo III using Linux WineHQ unless you're willing to lose your $60 leasing license to play the game. Blizzard doesn't care about your experience and you're just a notch on a wheel of greed for as far as they're concerned. If you value your money and game culture, there are better alternatives out there. 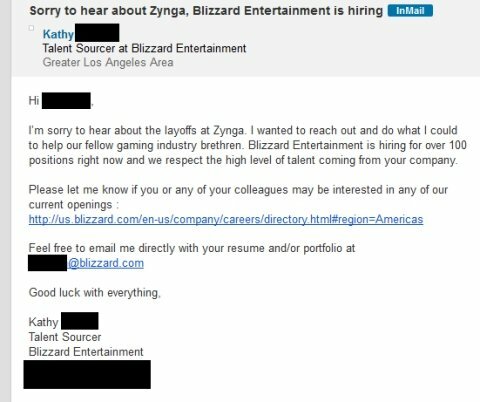 As for this Zynga case...a Reddit user posted a LinkedIn letter sent from a talent source at Blizzard Entertainment, as showcased below. Oh look at those comments on the image page...”Good guy Blizzard”....right. Now if only Blizzard could be as nice to their own customers as they are to Zynga's former employees, I guess we'd only have nice things to say about their business practices, eh? Nevertheless, when you have gambling-inducing features such as a Real-Money Auction House, and all sorts of ridiculous stipulations and restrictions attached to the gameplay experience to accommodate said Real-Money Auction House (i.e., always-on DRM), you have to deal with things as if you were running a big casino as opposed to focusing on offering gamers a fun, memorable time. To be completely clear, there will always be gamers who are going to keep running into these auto-ban scenarios, who will keep losing money and who will keep getting the rotten end of the deal when it comes to Diablo III. Folks, this is the freedom you trade in for an always-on experience...you have no freedom.